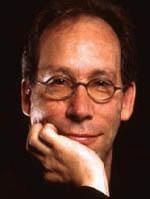 Lawrence Krauss, a Foundation Professor in ASU's School of Earth and Space Exploration and the Department of Physics, will receive the 2012 Public Service Award from the National Science Board. The NSB is the 25-member policymaking body for the National Science Foundation and advisory body to the President and Congress on science and engineering issues, according to news from ASU. The NSB Public Service Award honors individuals and groups that have made substantial contributions to increasing public understanding of science and engineering in the United States. Previous winners include Alan Alda, host of Scientific American Frontiers; Ira Flatow, host of National Public Radio’s Science Friday; and Craig Barrett, chairman of Intel Corp."
Lawrence has authored more than 300 scientific publications and nine books, including the international bestseller "The Physics of Star Trek," an entertaining and eye-opening tour of the Star Trek universe, and "Beyond Star Trek," which responds to recent exciting discoveries in physics and astronomy and takes a look at how the laws of physics relate to notions from popular culture. His recent book on physicist Richard Feynman, "Quantum Man," was awarded the 2011 Book of the Year by Physics World magazine in the UK. His most recent bestseller, "A Universe from Nothing," offers provocative, revelatory answers to the most basic philosophical questions of existence. It was on the New York Times Best Sellers list for nonfiction within a week of its release. In addition to being a professor at ASU, Lawrence is the director of the Origins Project, which explores key questions about our origins, who we are and where we came from, and then holds open forums to encourage public participation. Lawrence will receive the NSB Public Service Award for an individual medal and certificate at an awards ceremony and dinner on May 3 at the U.S. Department of State in Washington, D.C. Other honorees will include the recipients of the Vannevar Bush Award, the NSB Public Service Award for a group and National Science Foundation's Alan T. Waterman Award. Arizona's only producing oil and gas wells are on the Navajo reservation in the far northeast of the state, along the southern edge of the Paradox basin. A new assessment by the U.S. Geological Survey "estimated means of 560 million barrels of undiscovered oil, 12,701 billion cubic feet of undiscovered natural gas, and 490 million barrels of undiscovered natural gas liquids in the Paradox Basin of Utah, Colorado, New Mexico, and Arizona." The assessment does not include more uncertain resources such as oil in the Precambrian Chuar Group. 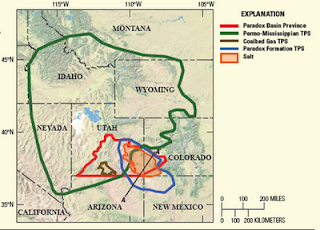 Ref: Whidden, K.J., 2012, Assessment of undiscovered oil and gas resources in the Paradox Basin Province, Utah, Colorado, New Mexico, and Arizona, 2011: U.S. Geological Survey Fact Sheet 2012–3031, 4 p.
The ASU School of Earth & Space Exploration is hosting a week-long Earth and Space Science Teacher Leadership Academy again this summer, in collaboration with the American Geosciences Institute (AGI) and NASA. Successful applicants will receive training in current NASA research and other hot topics in Earth and space sciences, abundant teaching resources, continuing education credit, and a stipend. The application deadline is Monday 30 April. Refer to the posted flyer for details. professional development leaders in their home school districts. Participants will receive a stipend of $150/day and continuing education credits (graduate credit is available at an additional charge). 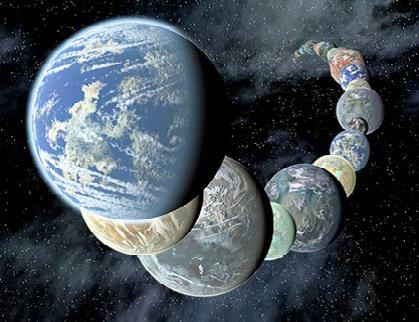 • Planning, conducting and evaluating your own successful Earth and space science workshops. Nominations should be made to Dr. Steven Semken, School of Earth and Space Exploration, ASU, at semken@asu.edu. The UA HiRISE camera team provided more evidence at the Lunar & Planetary Science Conference in Houston that Mars may have liquid water at or near its surface today, offering the tantalizing possibility of biological oases comparable to some found in Antarctica. 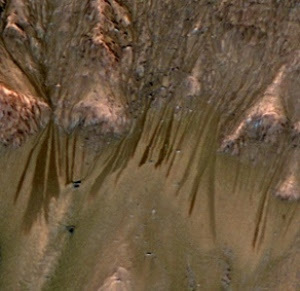 A report on Nature's website reports the HiRISE team doubled the number of "hundreds of narrow streaks on steep slopes inside crater walls" that appear to be the result of running water [right, credit NASA/JPL/UA]. UA planetary scientist Alfred McEwan is said to be "now a little more willing to state the obvious explanation for the streaks: that water ice, just below the surface, is melting just enough to flow through the pores of the sandy material at or near the surface." For the past decade the geoscience community has struggled with building an operational cyberinfrastructure. The challenges are much less technical than organizational, cultural, and social. However, in the past few years we've seen a tremendous convergence across all the disciplines towards a common vision of how to create the data equivalent of the world wide web. Tomorrow, the National Science Foundation is holding a national webinar with the White House Office of Science and Technology Policy (OSTP) on "Big Data." We expect NSF will talk about the EarthCube initiative among other topics. NSF is taking a revolutionary path to get an effective cyberinfrastructure under development in the next 18 months or so, through EarthCube. NSF has pushed teams of scientists to organize around a dozen themes in work groups to come up with community-driven and realizable roadmaps by June. AZGS heard today that we are funded to lead the EarthCube Governance Work Group, involving about 60 organizations and institutions worldwide. We are examining existing organizational structures and other options that could constitute a sustainable infrastructure, with guidance from a 10-member steering committee of cyberinfrastructure leaders from many fields. All the groups will convene in Washington DC in mid-June to critique and shape each others ideas. NSF intends to use this input to shape funding solicitations coming out in July to put the plans into effect. EPA announced a new rule today that for the first time caps the amount of carbon dixoide (CO2) that can be emitted by power plants using fossil fuels and requires that the CO2 be captured and stored so it does not reach the atmosphere. The rule is structured so as to primarily target new coal-fired plants. Existing plants and those under construction are exempt. Beneficiaries are natural gas fueled plants and nuclear. The AAAS Science Insider blog notes that nearly all gas-fired plants built since 2005 meet the new limits. 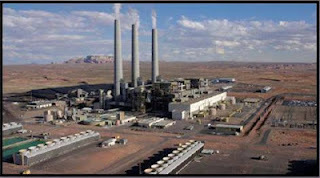 Science Insider also points out that the measure does not provide for additional research or testing of Carbon Capture and Storage (CCS) technology. "...the fact that the new standard doesn't cover existing plants, and makes it relatively easy for gas plants to comply, could further reduce incentives to develop better and cheaper methods for separating CO2 from emissions and then burying or storing the gas." EarthWeek, a showcase of research by undergraduate and graduate students in the University of Arizona School of Earth and Environmental Sciences, will be held March 28-30 in the Student Union Memorial Center. EarthWeek started 3 years ago as an outgrowth of the long-running annual student-run GeoDaze events in the Geoscience Dept. Arizona-based Freeport McMoRan Copper & Gold was the 5th most "controversial" mining company in the world in 2011, based on analysis of news media and other public criticism of companies’ "environmental, social and governance performance." Swiss-based RepRisk "monitors the level of criticism to which a company is exposed" to create a RepRisk Index (RRI) which "measures the risk to a company’s reputation, not its actual reputation in general." RepRisk summarized the criticisms saying "Freeport-McMoRan Copper & Gold faced allegations of human rights abuses, particularly in Papua New Guinea where its subsidiary was accused of perpetuating the abuse of workers by paying police to guard its Grasberg Mine. It was further accused of contaminating water bodies with heavy metals from mine tailings." RepRisk also noted that Indonesian workers "have also been involved in a pay dispute with the company that resulted in a 3-month strike of 8,000 miners" which has been the source of much negative press. Could Cholla power plant fall to War on Coal? Have we seen "peak gold"?